Today, the phrase “self driving cars” projects a future where cars will drive themselves. In the future, the same phrase will mean the cars of yesteryear that we had to drive ourselves. Autonomous vehicles are computers we will put ourselves inside of, and we will depend on them to make our lives safer. These vehicles are crafted by the works of engineers, physicists, and mathematicians — indeed, it is the accuracy of the works of these individuals on whom we will entrust our safety. Upon achievement of our quest, non-autonomous vehicles are likely to be outlawed on public roadways given the perversity of the popularity of fatal car accidents because of human error. Designated private areas will let manual car drivers carry out their hobby, likely to be perceived similarly to designated smoking rooms at airports — “those weird people huddled together engaged in risky endeavors”. We will look back in time and perceive human car drivers with similar puzzlement as we do of elevator operators of the past. Ride share apps like Uber and Lyft will swiftly embrace self driving cars. This will in turn lower the cost of rides to the point where the efficiency of hailing an autonomous car will make less people purchase their own vehicles. Tesla, however, has a competing business model where the hope is that the car will switch into taxi mode to make money for the owner while she is busy at work (Figure 1). Either way, plot twists on the concept of sole car ownership is upon us in the future. I have written about software and architectural vulnerabilities in car systems and networks in Chapter 6: Connected Car Security Analysis — From Gas to Fully Electric of my book Abusing the Internet of Things: Blackouts, Freakouts, and Stakeouts. These types of security vulnerabilities are a serious risk and we must strive for further improvement in this area. The scope of this article, however, is to focus on risks that come to light in the realm of cross disciplinary studies — upcoming threat vectors that are rooted in the understanding of the design of these vehicles, rather than the applying of well known threat vectors to autonomous car design. Indeed, the secure design of autonomous vehicle software calls for a polymathic thinking, a cross-disciplinary approach that not only invokes the romance of seeking out new knowledge, but also applying a holistic framework of security that includes the induction of new attack vectors that go well beyond comprehending traditional security vectors as they may apply to autonomous software. Polymathic thinking calls upon designers to bring together realms of philosophy, economy, legalese, and socio-economic concerns, so that we can align these areas to the concerns of security and safety. As designers and citizens, cross-disciplinary conversations are the spark we need to achieve efficiency and safety from autonomous vehicles. This article series is an attempt to ignite that spark, which we begin by tackling the issue of morality and how it will relate to self-driving cars. Airline pilots can be faced with emergency situations that require landing at the nearest airport. Should the situation be that returning to nearest airport isn’t feasible, alternative landing sites such as fields or rivers may be an option. Highway roads, albeit hazardous given powers lines, oncoming traffic, and pedestrians, may still be an option for smaller planes. The 2-D nature of car driving, on the other hand, mostly lend to a brake or swerve split second decision on the part of the driver when it comes to avoiding accidents. In many car accidents, drivers don’t have enough time to survey the ongoing situation to make the most rational decision. When it comes to conversations on avoiding accidents and saving lives, the classic Trolley Problem is oft cited. The utilitarian viewpoint will deem it just to pull the lever because it minimizes the amount of lives lost. A competing viewpoint is that pulling the lever constitutes an intentional action that leads to the death of one individual while not doing anything does not actively contribute to the five deaths that would have happened anyway. The act of pulling a lever to save more lives makes some of us uncomfortable because we are actively involved in an action that kills a set of lives. There are many other variants of the Trolley Problem that have been put forth as thought experiments, yet they are useful in arguing moral decisions that must be made by software developers who code self driving software. There are other issues besides the trolley problem that are at play — a vehicle veering of a cliff because of a bug in software code and killing the passengers. Our quest for self driving cars will get us to a world where less people die due to car accidents, yet some people will still perish for reasons such as software bugs. Who then must be held responsible for accidents and deaths? The individual developer who developed that specific piece of fault code? The car company? Legal precedence is unlikely to allow commercial companies to offload legal repercussions to the car owner for the fact that the owner has lost autonomy by virtue of the self driving capabilities. Here’s a question to ask yourself. How many times when you have been driving have you had to make a forced decision on which group of people to drive into and kill? You know, the five nuns or the single child? Or the ten robbers or the single little old lady? For every time that you have faced such decision, do you feel you made the right decision in the heat of the moment? Oh, you have never had to make that decision yourself? What about all your friends and relatives? Surely they have faced this issue? And that is my point. This is a made up question that will have no practical impact on any automobile or person for the foreseeable future. Just as these questions never come up for human drivers they won’t come up for self driving cars. It is pure mental masturbation dressed up as moral philosophy. You can set up web sites and argue about it all you want. None of that will have any practical impact, nor lead to any practical regulations about what can or can not go into automobiles. The problem is both non existent and irrelevant. The fallacy in Brooks’ argument is that he does not take into account the split second decisioning humans are incapable of when it comes to car accidents. The time taken by our brains to decide what direction to swerve the car and hit the brakes is too long. On the other hand, sensors in autonomous vehicles have the capacity to categorize data from sensors to make decisions within milliseconds. According to data obtained from the self-driving system, the system first registered radar and LIDAR observations of the pedestrian about 6 seconds before impact, when the vehicle was traveling at 43 mph. As the vehicle and pedestrian paths converged, the self-driving system software classified the pedestrian as an unknown object, as a vehicle, and then as a bicycle with varying expectations of future travel path. At 1.3 seconds before impact, the self-driving system determined that an emergency braking maneuver was needed to mitigate a collision. According to Uber, emergency braking maneuvers are not enabled while the vehicle is under computer control, to reduce the potential for erratic vehicle behavior. The vehicle operator is relied on to intervene and take action. The system is not designed to alert the operator. It is clear from the NTSB report that Uber’s autonomous software classified the pedestrian more accurately as it approached, an “unknown object” followed by “a vehicle” and then as a “bicycle” — which is accurate because the victim of the accident was crossing the road with her bicycle. The emergency braking system was disabled in this case ultimately leading to the accident. The car did not even alert the driver (by design). It is not clear yet as to when the vehicle would have started braking (6 seconds prior versus 1.3 seconds) had the automatic braking feature been enabled. Nonetheless, if the system had been enabled, the software would’ve had to make the call on when to apply the brakes, perhaps a combination of manual tuning and machine learning. Machine learning systems are able to classify objects in images with impressive accuracy: the average human error rate is 5.1% while machine learning algorithms are able to classify images with an error rate of 2.251%. The self driving Uber was probably using a combination of Regional Convolutional Neural Networks to detect objects in near real-time. It is unknown what classification or segmentation algorithms were employed in the case of the accident, and there are a lot more algorithms in scope of a self driving car than object classifiers — yet, it is evident that the hardware and software technology in self driving cars surpass the physics of human senses. We need to bring the issue of machine decisioning into the forefront if we are going to make any headway towards making our autonomous vehicle future safe. Brooks’ argument dismisses the need for such decisioning outright, yet we have evidence today that demonstrates that this is one of the more important issues we ought to make sure we solve in a meaningful manner. Brooks is right in saying that humans in control of a car almost never have the ability to decide upon who to drive into and kill, but his argument doesn’t account for the technical abilities of autonomous car computers that will make it possible for software to make these decisions. Back to the topic of the Trolley Problem, engineers must account for decisions when a collision is unavoidable. These decisions will have to select from predictable outcomes, such as steering the vehicle to the left to minimize impact. These decisions will also include situations that could save the lives of the car passengers while impacting the lives of people outside of the vehicle, such as pedestrians or passengers of another vehicle. Should the car minimize the total loss of life, or should the car prioritize the lives of it’s own passengers? 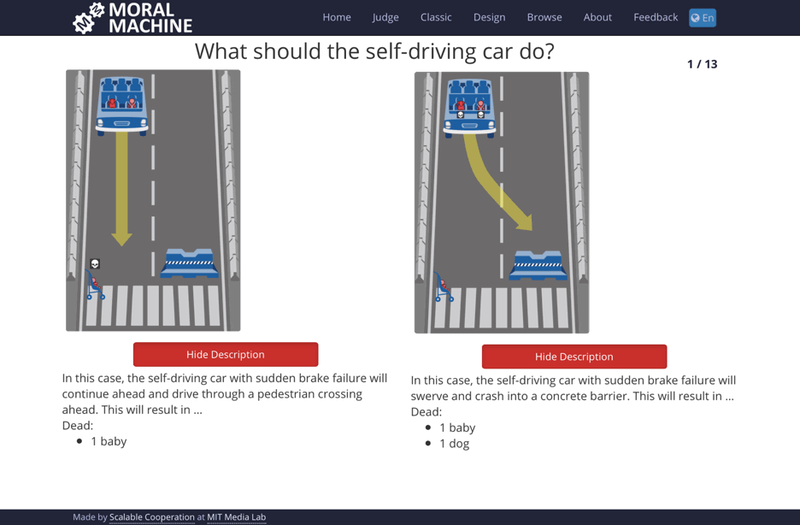 The Moral Machine project at MIT is an effort in illustrating moral dilemmas that we are likely to face and have to “program in”. Their website includes a list of interactive dilemmas relating to machine intelligence (Figure 3). Imagine a case where the car computes that an collision is imminent and it has to swerve to the right or to the left. The sensors of the car quickly recognize a cyclist on the right and also to the left, the difference being that the cyclist on the left is not wearing a helmet. Should the car be programmed to swerve left since the cyclist on the right is deemed “more responsible” because he is wearing a helmet (and who must conjure up this moral calculus?)? Or should it pick a side at random? Autonomous cars will continuously observe objects around them — what of the case where the car is able to scan the license plate of a nearby vehicle and classify bad drivers versus good based on collision history? Perhaps this information could be useful in navigating around potential rogue drivers that demonstrate evidence of bad driving history, but should the same information be leveraged to decide who to collide into and kill should an unavoidable collision occur? Autonomous Vehicles (AVs) should reduce traffic accidents, but they will sometimes have to choose between two evils-for example, running over pedestrians or sacrificing itself and its passenger to save them. Defining the algorithms that will help AVs make these moral decisions is a formidable challenge. We found that participants to six MTurk studies approved of utilitarian AVs (that sacrifice their passengers for the greater good), and would like others to buy them, but they would themselves prefer to ride in AVs that protect their passengers at all costs. They would disapprove of enforcing utilitarian AVs, and would be less willing to buy such a regulated AV. Accordingly, regulating for utilitarian algorithms may paradoxically increase casualties by postponing the adoption of a safer technology. The findings are not surprising. It is straightforward to grasp the utilitarian view point from an intellectual perspective, yet all bets are off when the situation includes ourselves and our loved ones. Yet, the design of autonomous vehicles has spawned a moral challenge that humankind has not faced in the past: that we must optimize our solution to this moral dilemma, design for, and operationalize on unconscious hardware a system that will decide who is worthy of living. In the absence of federal regulations, car companies may choose the owner to select from various types of decisions, or perhaps manufacturers may offer the prioritization of passenger lives as part of a luxury upgrade package, skewing favor towards population that is able to afford it. 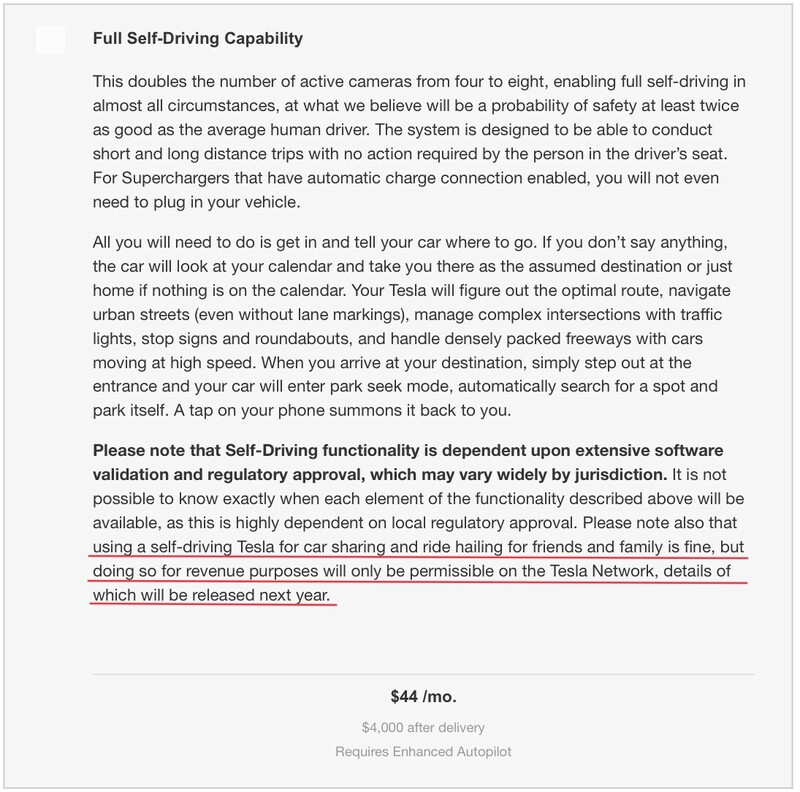 Figure 4 depicts a mockup of the Tesla iPhone app allowing the owner to change the setting on or off. jailbreaking can extend to protocols designed for cooperation — for example, two cars halting at a stop sign simultaneously. An industry accepted protocol could propose a simple solution (in the case of 2 cars) where the cars engage in a digital coin toss and the winner gets to go first. If people were to jailbreak their car software to subvert this functionality and always go first, the situation could lead to confusion and perhaps collisions if every other car owner were to circumvent protocols in the same way. The term ‘jailbreak’ was coined by communities that have work to modify the iOS operating system that powers iPhones and iPads. Apple has asserted tight controls on their devices that people in the jailbreak community wish to circumvent so that they are able to further customize and add features to their devices that are not offered by Apple. From Apple’s vantage point, modification of core operating system code can lead to adverse effects and become unsustainable for Apple to keep track of or be responsible for changes made by third-parties. Additionally, even though many jailbreaking tweaks offer security features, they overtly trespass on fundamental security controls put in place by Apple, thereby putting the jailbroken device at additional risk.Known security vulnerabilities in iOS are needed to develop and execute a jailbreak. These vulnerabilities allow for unauthorized source code to be executed by the iPhone and iPad. 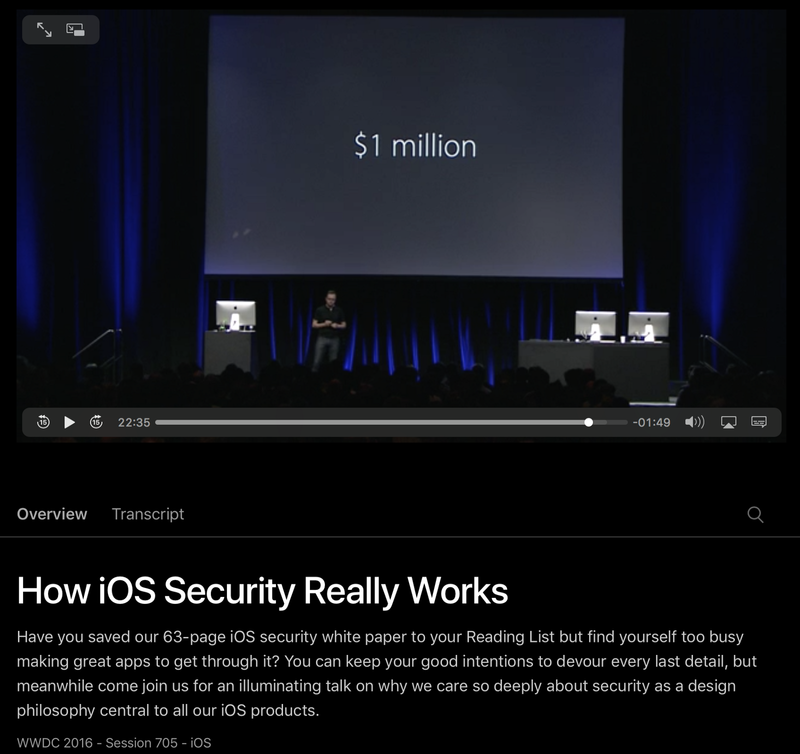 At Apple’s World Wide Developer Conference in 2016, Ivan Krstic, head of Security Engineering and Architecture at Apple, estimated that jailbreakers and hackers generally have to find and exploit between 5 to 10 distinct vulnerabilities to be able to fully exploit the inherent platform security mechanisms. Furthermore, he pointed out that the ongoing blackmarket rate of a remotely exploitable vulnerability (that can lead to a jailbreak) was estimated to be around $1 million (Figure 6). This, compared to the cost of similar vulnerabilities for other popular operating systems, suggests that Apple’s anti-jailbreak mechanisms and platform security features are harder to exploit. In 2016, the security community was alerted to a sophisticated iOS spyware named Pegasus that was found by Bill Marczak and engineers at the security company Lookout. An activist friend of Marczak located in the United Arab Emirates forwarded him a suspicious SMS message he received that contained an Internet link that when clicked led to the immediate installation of spyware. Upon analysis, it became evident that this spyware leveraged three vulnerabilities in iOS to remotely exploit an iPhone and gain full control. Numerous attribution theories circulate this incident, the most notable being the NSO Group, an Israeli spyware company. Researches found references to NSO in the source code for Pegasus, along with evidence that in addition to the targeting of Ahmed Mansoor in the UAE, the exploit was also targeted towards Mexican journalist Rafael Cabrera, and quite possibly additional targets in Israel, Turkey, Thailand, Qatar, Kenya, Uzbekistan, Mozambique, Morocco, Yemen, Hungary, Saudi Arabia, Nigeria, and Bahrain. Remotely exploitable vulnerabilities in iOS are sought after not only because iPhones and iPads enjoy a healthy market share, but also because finding these vulnerabilities is harder in Apple’s products. In Apple’s iOS Security Guide document, the emphasis on system security is emphasized, i.e. utmost care is taken to make sure that only authorized source code is executed by the devices and that various security mechanisms work in tandem to make remotely exploitable conditions difficult. In my book Abusing the Internet of Things, I have outlined the nature of the Controller Area Network (CAN) architecture in cars, which in essence is like a computer network where all other physically connected computers are fully trusted. Electronic Control Units (ECUs) are various computers in the car that relay various sensor information as well as command other ECUs to take specific action. Traditionally, the attack vectors targeting such an architecture has required physical access to the car. With the prevalence of telematics that employ cellular communications that essentially puts modern cars on the Internet, the CAN architecture is not sufficient to provide reasonable security assurance, i.e. should an external hacker be able to hack into the car by exploiting a flaw in the telematics software, she could then remotely control the rest of the car. Such as scenario can pose an exponential impact should the attacker choose to infect and command cars en masse. Elon Musk has publicly stated that such a fleet-wide hack is one of his concerns. As with iOS devices, remotely exploitable vulnerabilities can not only allow hackers to access and command the infected device, but also to jailbreak the device to subvert functionality. Circling back to our discussion on “programming in” moral rulesets per federal regulations, security vulnerabilities can allow individuals to jailbreak their autonomous vehicles and bypass these controls. The rumor of Apple building an autonomous vehicle has been upon the media for a few years now. A case could be made, albeit speculatively, that Apple may have an advantage of successfully operationalizing architecture that makes it difficult to bypass security controls that are built in to the product. In more tangible news, companies such as General Motors has appointed executive roles to foresee the secure design and architecture of vehicles. An argument can be made in the favor of vehicle jailbreaking in terms of humanitarian situations where journalists may be assigned vehicles that prohibit access to certain areas. These situations will have to be carefully weighed agains the double edged nature of implementing security mechanisms that are hard to circumvent. The prevalence of autonomous vehicles is going to bring about moral dilemmas into our lives that have traditionally been confined to the province of academic contemplation. The transformative and disruptive nature of these technologies are bound to ignite legal discussions and precedences that may advance or even temporarily slow down adoption of self driving cars. The problem of Risk Bias constantly looms around our everyday misconceptions: we have a 1 in 11 million chance of being killed in an airplane crash, compared to a 1 in 5,000 chance of being killed in a car accident. The World Health Organization reports that more than 1.25 million people die each year as a result of road traffic crashes. The compute power of self driving cars will put is in a position to lower the death rates due to vehicle collisions, yet we are bound to be faced with deaths due to unavoidable collisions. In other words, less people will die, but they will die for reasons that are uncommon to our emotional faculties such as software bugs, non-compliance due to circumvention of programmed moral controls, unfair moral controls and the lack of regulation, and many unforeseen reasons that we will uncover. The status quo of 1.25 million global deaths due to road traffic crashes is not acceptable. Add to this number the countless suffering of people that are injured in countless crashes. Not to mention the countless hours of time spent in commute that can be utilized by people to instead spend time doing constructive things and having meaningful conversations. It is clear that our advancements in technology is the way to achieve improvement that will benefit us greatly, and while we may have misgivings on our way to success, the notion that we are moving towards betterment ought to fill us with unbounded and relentless optimism for the years ahead. It’s been a decade since we’ve accepted the idea that the perimeter strategy to security is ineffective: The endpoints must strive to protect their own stack rather than rely on their network segment being completely trust worthy. However, this notion has mostly permeated the corporate space as an emergency. Even such, businesses are still struggling with implementing controls in this area given the legacy of flat networks and Operating System design. When it comes to residences, the implicit notion is that controls beyond Network Address Translation (NAT) aren’t immediately necessary from the perspective of cost and complexity. The emergence of Internet of Things (IoT) is going to dramatically change this notion. My point is illustrated in "Reconsidering the Perimeter Security [PDF]" where I take upon the security design of the Belkin WeMo baby monitor, WeMo wireless switch, and the Net-Cam Wi-Fi camera. "...But that's not the only issue plaguing this device. The other is a very poor security model that leaves the WeMo open to unwelcome monitoring. The WeMo allows any iOS device on your network to connect to it and listen in without a password. If that's not bad enough, when an iPhone has connected once on the local network it can later tune into the monitor from anywhere in the world". I've demonstrated the issue Sediman points out in the video above. The paper goes into more technical details. In the case of the WeMo switch, it was found that any local device can turn it off without any additional authorization. In the paper, I describe how to write a script to do this. The Belkin NetCam uses SSL and requires the user to log-in even if the user is on the local Wi-Fi. However, as shown in Figure 5, it does manage to send the credentials in clear to a remote server. This enables local malware or any server in the path via the ISP to capture the credentials and spy on the camera owners. Given the upcoming revolution of automation in our homes, we are already seeing self-installable IoT devices such as the candidates discussed. As seen by the detailed illustrations in the above examples, we cannot secure our future by asserting that IoT devices and supporting applications have no responsibility to protecting the user’s privacy and security beyond requiring the user setup a strong WiFi password. IoT device manufacturers should lay the foundation for a strong security architecture that is usable as well as not easily susceptible to other devices on the network. In these times, a compromised device on a home network can lead to the loss of financial information and personal information. If IoT device vendors continue their approach of depending on the local home network and all other device being completely secure, we will live in a world where a compromised device can result in gross remote violation of privacy and physical security of it’s customers. The phenomenon of the Internet of Things (IoT) is positively influencing our lives by augmenting our spaces with intelligent and connected devices. Examples of these devices include lightbulbs, motion sensors, door locks, video cameras, thermostats, and power outlets. By 2022, the average household with two teenage children will own roughly 50 such Internet connected devices, according to estimates by the Organization for Economic Co-Operation and Development. Our society is starting to increasingly depend upon IoT devices to promote automation and increase our well being. As such, it is important that we begin a dialogue on how we can securely enable the upcoming technology. I am excited to release my security research on the Philips hue lighting system. The hue personal wireless system is available for purchase from the Apple Store and other outlets. Out of the box, the system comprises of wireless LED light bulbs and a wireless bridge. The light bulbs can be configured to any of 16 million colors. The Hacking Lightbulbs: Security Evaluation of the Philips hue Personal Wireless Lighting System paper discusses top threats associated with the product in addition to a detailed analysis of how the system works. I'd like to highlight a particular vulnerability that can be used by malware on an infected machine on the user's internal network to cause a sustained blackout. A video demonstration of this vulnerability can be seen in the video above. For details, please read the PDF. The sample malware script (hue_blackout.bash) can be found in Appendix A. - Lighting is critical to physical security. Smart lightbulb systems are likely to be deployed in current and new residential and corporate constructions. An abuse case such as the ability of an intruder to remotely shut off lighting in locations such as hospitals and other public venues can result in serious consequences. - The system is easily available in the marketplace and is one of the more popular self installable wireless light bulb solutions. - The architecture employs a mix of network protocols and application interfaces that is interesting to evaluate from a design perspective. It is likely that competing products will deploy similar interfaces thereby inheriting abuse cases. The hue system is a wonderfully innovative product. It is therefore important is to understand how it works and to ultimately push forward the secure enablement of similar IoT products. The “protect the data, not the (mobile) device” mantra is permeating across organizations today, and that is a good thing. In this article, I wish to support the thought process by lending evidence for the following hypothesis: cloud synchronization services are likely to become a popular attack target by way of the desktop which is currently the weakest link. Individuals in the work place that use an iOS device (iPhone or iPad) also own a desktop (or laptop). The desktop operating system (OSX or Windows) is still the choice avenue of attack. Individuals are increasingly relying upon applications on their mobile devices to store private information (credentials, financial, health). Most users use iCloud to sync data between their applications on various devices. Note that iCloud files sync across devices regardless of if there is a corresponding app installed on the particular device. A malware or root-kit that infects the desktop can steal and influence data that is synced using iCloud (as illustrated in the rest of this article). The iCloud service offers two distinct services. As shown in Figure 1, the set of core services allows the user to backup and restore their device, as well as sync (i)Messages, contacts, calendars, reminders, Safari bookmarks & open tabs, notes, Passbook information, photos, and use the Find My iPhone feature. These services can be turned on individually or managed via an MDM (Mobile Device Management) solution. Should these services be utilized, the “keys to the kingdom” in being able to access the user’s device data fully relies upon the strength and secrecy of the user’s iCloud password. In my blog post titled Apple’s iCloud: Thoughts on Security and the Storage APIs [PDF], I also discuss this risk in addition to a possibility of automated tools that scrape credentials of users compromised from other attacks (and published in forums and avenues such as @PasteinLeaks) to capture users’ iOS device data en masse. The second service offered as part of the iCloud services are Storage APIs that 3rd party developers can use to have the user’s sessions and application data seamlessly sync across devices and Operating Systems. This feature is the focus of this write-up. For example, the GoodReader app can be configured to use iCloud to manage documents across devices (iPhone in Figure 3 and the iPad in Figure 4). For the purposes of the attack vector, assume that the user’s Macbook Air has been compromised. Traditionally, the attacker would be limited to the data stored on the OSX file-system. If the attacker wanted to gain access to data on other devices, the best bet would be to look for backup files. However, many users these days do not routinely backup their iOS devices with their laptops and choose to utilize iCloud instead. In this situation, the attacker can directly browse to the user’s ~/Library/Mobile Documents/ directory to access application data stored by apps that utilize the iCloud Storage APIs. What’s more - any changes the attacker makes to files in this directory are synced back to the iOS devices. drwxr-xr-x 3 user staff 102 Jan 29 21:04 .
drwxr-xr-x 4 user staff 136 Jan 29 21:02 ..
At this point, the user can steal the Fiscal_Q1.pdf, delete, or alter it. These changes will be reflected onto the user’s iOS device within seconds. Imagine the implications these might have to a victim user who’s profession is in the financial, medical, and military fields. The desktop OS is quite likely still the weakest link and can give rise to Cross Device Attacks such as these. Future malware and rootkits are likely to exploit this. In case of iOS devices with Document sync turned on, attackers and rootkit authors are likely to take advantage of situations where one of the devices can be easily compromised. They are likely to target popular iCloud apps to steal data as well as to modify and influence business transactions to their advantage. Developers need to be cognizant of data-flow within their apps. Not all types of data, specifically credentials, need to be synced across devices. Note that app data may also sync by way of Apple’s core backup & restore service; developers can mark files that shouldn’t by synced by invoking addSkipBackupAttributeToItemAtURL or storing the files in Library/Caches within the iOS bundle. Enterprises must prepare to enable sync services. At the moment, the easy solution may be to configure employee devices via MDM to disable iCloud backup and documents. However, customers and employees will demand the enablement of sync services such as these will provide seamless transition across devices and increase in productivity. Perhaps the convergence of desktop and mobile Operating Systems and devices may pave the way to the right direction - it can be argued that the Sandbox mechanism in OSX that draws inspiration from the iOS sandbox architecture is one example of this. In summary, cloud sync technologies have blurred lines surrounding data compartmentalization. Organizations that are seriously looking into creating solid mobile security strategies must accept this reality - the entire ecosystem of devices, including attack vectors across devices, should be taken into account and incorporated into the strategy. [For easier reading you can download a PDF of this article]. At the 2011 World Wide Developer Conference in San Francisco, Steve Jobs revealed his vision for Apple’s iCloud: to demote the desktop as the central media hub and to seamlessly integrate the user’s experience across devices. Apple’s iCloud service comprises of two distinct features. The first is to provide the user with the ability to backup and restore the device over the air without having to sync with an OSX or Windows computer. This mechanism is completely controlled by Apple and also provides free email and photo syncing capabilities. The second feature of iCloud allows 3rd party developers to leverage data storage capabilities within their own apps. In this article, I will provide my initial thoughts on iCloud from a security perspective. The emphasis of this article is to discuss the iCloud storage APIs from a secure coding and implementation angle, but I will start by addressing some thoughts on the backup and restore components. Starting with iOS5, iPhone and iPad users do not have to sync their devices with a computer. Using a wireless connection, they can activate their devices as well as backup and restore their data by setting up an iCloud account. Following are some thoughts on risks and opportunities that may arise for businesses as their employees begin to use iOS devices that are iCloud enabled. High potential for mass data compromise using automated tools. An iOS device that is iCloud enabled continuously syncs data to Apple’s data-centers (and to cloud services Apple has in turn leased from Amazon (EC2) and Microsoft (Azure)). The device also performs a backup about once a day when the device is plugged into a power outlet and when WiFi is available (this can also be manually initiated by the user). In this case, the device had previously authenticated to Apple domains (*.icloud.com and *.apple.com). Most likely, those servers initiated a back-end session with Amazon tied to the user’s session based on the filename provided to the PUT request above. The biggest point here from a security perspective is that all the information is protected by the user’s iCloud credentials that is present in the Authorization: X-MobileMe-AuthToken header using basic access authentication (base 64). Continuously scrape compromised usernames and password of other services from sources such as http://twitter.com/PastebinLeaks. Attempt credentials of each compromised account (whose username is in the form of an email as required by iCloud) on iCloud. For every successful credential, download the restore files thereby completely compromising the user’s information. The risk to organizations and government institutions is enormous. A malicious entity can automatically download majority of data associated with an individual’s iPhone or iPad of that user’s account simply by gaining access to their iCloud password (which could have been compromised due to password reuse at another service). Information security teams must integrate baselines and policies relating to iCloud. Also, Mobile Device Management (MDM) vendors are likely to integrate iCloud related policy settings and this should be leveraged. 3rd party apps as well as iOS apps developed in-house should be assessed for security vulnerabilities and the iCloud API related principles listed in the next section. A significant aspect of the iCloud platform is the availability of the iCloud storage APIs [http://developer.apple.com/icloud/index.php] to developers. These APIs allow developers to write applications that leverage the iCloud to wirelessly push and synchronize data across user devices. iCloud requires iOS5 and Mac OSX Lion. These operating systems have been recently released and developers are busy modifying their applications to integrate the iCloud APIs. In the coming months, we are bound to see an impressive increase in the number of apps that leverage iCloud. In this section, I will discuss my initial thoughts on how to securely enable iOS apps using the iCloud Storage APIs. I will step through how to write a simple iOS app that leverages iCloud Storage APIs. This app will create a simple document in the user’s iCloud container and auto update the document when it changes. During this walk-through, I will point out secure development tips and potential abuse cases to watch out for. [I have relied on Ray Wenderlich’s fantastic Beginning iCloud in iOS 5 tutorial(s) located at for the walk-through below. The tutorial can be found here: http://www.raywenderlich.com/6015/beginning-icloud-in-ios-5-tutorial-part-1]. This is the first step required to allow your test app to be able to use the iCloud services. The App ID is really a common name description of the app to use during the development process. Figure 1: Creating an App ID using the Developer provisioning portal. The provisioning portal also requires you to pick a “Bundle Identifier” in reverse-domain style. This has to be a unique string. For example, an attempt to create an App ID with the Bundle Identifier of com.facebook.facebook is promptly rejected because it is most likely in use by the official Facebook app. Select the “Provisioning” tab and click on “New Profile”. Pick the App ID you created earlier and select the devices you want to test the app on. Note that the simulator cannot access the iCloud API so you will need to deploy the app onto an actual device. Once you have the App ID configured, you have to create a provisioning profile. A provisioning profile is a property-list (.plist) file signed by Apple. This file contains your developer certificate. Code that is complied with this developer certificate is allowed to execute on the devices selected in the profile. Download the profile and open it (double-click and XCode should pick it up as shown in Figure 3). In Xcode, create a new project. Choose “Single View Application” as the template. Enter “dox” for the product name and the company identifier you used when creating the App ID. The Device family should be “Universal”. The “Use Automatic Reference Counting” option should be checked and the other options should be unchecked. Next, select your project in the “Project Navigator” and select the “dox” target. Click on “Summary” and go to the “Entitlements” section. The defaults should look like the screen-shot in Figure 5 and you don’t have to change anything. Now assume that the test device has the “Documents & Data” preference in iCloud set to “off”. In this case, if you run the project now, you should see the log notice shown in Figure 7. If the “Documents & Data” settings were turned “On”, you should see the log notice similar to Figure 8. Notice that the URL returned is a ‘local’ (i.e. file://) container. This is because the iCloud daemon running on the iOS device (and on OSX) automatically synchronizes information users put into this directory between all of the user’s iCloud devices. If the user also has OSX Lion, they can find their iCloud files created on iOS appear in their ~/Library/Mobile Documents/ directory. At this point, I’ll turn you over to Ray Wenderlich’s iCloud tutorials I referenced earlier. Go through Part 1 and Part 2 (you can stop at the end of “Setting Up the User Interface”). The tutorial is available here: http://www.raywenderlich.com/6015/beginning-icloud-in-ios-5-tutorial-part-1. Once you are done, you can deploy your app onto two separate iOS devices and watch the text sync using iCloud. The embedded video above demonstrates the app in action. The following are a list of security considerations that may be useful in managing risk pertaining to the iCloud storage APIs. Guard the credentials to your Apple developer accounts. It is important for you to safeguard your Apple developer account credentials and make sure the credentials are complex enough to prevent potential brute forcing. Someone with access to your developer account could release an app with the same Bundle Seed ID (discussed below) that accesses the users’ iCloud containers and ferries the information to the attacker. If you try to change the values of com.apple.developer.ubiquity-container-identifiers or com.apple.developer.ubiquity-kvstore-identifier (in your entitlements settings visible in Xcode) to begin with anything other than what you have in your provisioning profile, XCode will complain as shown in Figure 10. It is clear that Apple uses the Bundle Seed ID (Team ID) to constrain access to user data in iCloud between different organizations.As discussed earlier, if someone were to get Apple’s provisioning portal to issue a provisioning profile with someone else’s Team ID, they could write Apps that can (at least locally) have access to the user’s iCloud data since their local iCloud file:// mapping will coincide. Do not store critical information in iCloud containers, including session data. iCloud data is stored locally and synced to the iCloud infrastructure. Users often have multiple devices (iPhone, iPod Touch, iPad, Macbook, iMac) so their iCloud data will be automatically synced across devices. If a malicious entity were to temporarily gain access to the file-system (by having physical access or by implanting malware), he or she could gain access to the iCloud local containers (/private/var/mobile/Library/Mobile Documents/ in iOS and ~/Library/Mobile Documents/ in OSX). It is therefore a good idea not to store critical information such as session tokens, passwords, financial, and or healthcare data that is personally identifiable. Do not trust data in your iCloud to commit critical transactions. As discussed in the prior paragraph, an attacker with temporary access to a user’s file system can access iCloud documents stored locally. Note that the attacker can also edit or add files into the iCloud containers and the changes will be synced across devices. Once the attacker has issued the commands above, the doctor’s iCloud container will be updated with the modified information across all devices. In this example, the attacker has altered a particular patient’s record to remove listed allergies and replace the X-Ray image. The doctor will see the updated record when the medical app is accessed after the attacker makes these changes on the doctor’s Macbook Air (Figure 12). Other files will be treated as data and can only be deleted all at once. Doing this can allow users to notify you if a bug in your application is causing too much data to be written into iCloud which can exhaust users' storage quotas and thus create a denial of service condition. Take care to handle conflicts appropriately. Documents that are edited on multiple devices are likely to cause conflicts. Depending upon the logic of your application code, it is important to make sure you handle these conflicts so that the integrity of the user’s data is preserved. Understand that Apple has the capability to see your users' iCloud data. Data from the local device to the iCloud infrastructure is encrypted during transmit. However, note that Apple has the capability to look at your users' data. There is low probability that Apple would choose to do this but depending upon your business, there may be regulatory and legal issues that may prohibit storage of certain data on the iCloud. iOS sandboxing vulnerabilities may be exploited by rogue apps. Try putting in the string @”..\..\Documents” in URLByAppendingPathComponent or editing your container identifier in your entitlements to contain “..” or any other special characters. You will note that iOS will either trap your attempt at runtime or replace special characters that can cause an app to break out of the local iCloud directory. If someone were to find a vulnerability in iOS sandboxing or file parsing mechanisms, it is possible they can leverage this to build a rogue app that is able to access another app’s iCloud data. These security principles also apply to key-value data storage. The iCloud Storage APIs also allow the storage of key-value data in addition to documents. The security tips outlined in this article also apply to key-value storage APIs. Watch out for iCloud backups. As presented in the earlier section, the user can choose to backup his or her phone data into the iCloud. This includes the Documents/ portion within the app sand-box (Note: This is not the Documents folder created as part of the iCloud container, but is present as part the application bundle). If there is critical information you do not wish to preserve move it to Library/Caches. You may also wish to leverage the addSkipBackupAttributeToItemAtURL method to identify specific directories that should not be backed up. I hope this article contained information to help you and your organization think through security issues and principles surrounding iCloud. The ultimate goal is to enable technology, but in a way that is cognizant of the associated risks. Feel free to get in touch if you have any comments, questions, or suggestions. On March 17, 2011, I presented New Age Application Attacks Against Apple's iOS at BlackHat Barcelona. - Protocol handling attacks and secure design. - User Interface (UI) attacks and best practices. - Abusing and securely design Apple Push Notifications. - Man in the Middle attacks, Privacy Leaks, Identity Decloaking, and Countermeasures. In addition to these topics, the Appendix in the whitepaper contains a checklist of items to consider when assessing iOS applications. This list includes traditional application security weaknesses that also apply to iOS. Additional items to consider, such as data protection and file encryption applicable to iOS devices, are also presented in the Appendix. I trust many may find the information in the paper valuable and actionable. If you have any questions or feedback, please feel free to contact me. Millions of iOS users and developers have come to rely on Apple’s Push Notification Service (APN). In this article, I will briefly introduce details of how APN works and present scenarios of how insecure implementations can be abused by malicious parties. Apple’s iOS allows some tasks to truly execute in the background when a user switches to another app (or goes back to the home screen), yet most apps will return and resume from a frozen state right where they left off. Apple’s implementation helps preserve battery life by providing the user the illusion that iOS allows for full-fledged multi-tasking between 3rd party apps. This setup makes it hard for apps to implement features that rely on full-fledged multi-tasking. For example, an Instant Messaging app will want to alert the user of a new incoming message even if the user is using another app. To enable this functionality, the APN service can be used by app vendors to push notifications to the user’s device even when the app is in a frozen state (i.e. the user is using another app or is on the home screen). There are 3 types of push notifications in iOS: alerts, badges, and sounds. Figure 1 shows a screen-shot illustrating both an alert and a badge notification. iOS devices maintain a persistent connection to the APN servers. Providers, i.e. 3rd party app vendors, must connect to the APN to route the notification to a target device. So how can an app developer implement push notifications? For explicit details, I’d recommend going through Apple’s excellent Local and Push Notifications Programming Guide. However, I will briefly cover the steps below with emphasis on steps that have interesting security implications and tie them to abuse cases and recommendations. 1. Create an App ID on Apple’s iOS Provisioning Portal. This step requires you sign up for a developer account ($99). This is straight-forward: just click on App IDs in the provisioning portal and then select New App ID. Next, enter text in the Description field that describes your app. The Bundle Seed ID is used to signify if you want multiple apps to share the same Keychain store. The Bundle Identifier is where it gets interesting: you need to enter a unique identifier for your App ID. Apple recommends using a reverse-domain name style string for this. The Bundle Identifier is significant from a security perspective because it makes its way into the provider certificate we will create later (also referred to as the topic). The APN trusts this field in the certificate to figure out which app in the target user’s device to convey the push message to. As Figure 2 illustrates, an attempt to create an App ID with the Bundle Identifier of com.facebook.facebook is promptly refused as a duplicate, i.e. the popular Facebook iOS app is probably using this in it’s certificate. Therefore, if a malicious entity were to bypass the provisioning portal’s restrictions against allowing an existing Bundle Identifier, then he or she could possibly influence Apple to provision a certificate that can be abused to send push notifications to users of another app (but the malicious user would still need to know the target user's device-token discussed later in this article). 2. Create a Certificate Signing Request (CSR) to have Apple generate an APN certificate. In this step, Keychain on the desktop is used to generate a public and private cryptographic key pair. The private key stays on the desktop. The public key is included in the CSR and uploaded to Apple. The APN certificate that Apple provides back is specific to the app and tied to a specific App ID generated in step 1. 3. Create a Provisioning Profile to deploy your App into a test iOS device with push notifications enabled for the App ID you selected. This step is pretty straight forward and described in Apple’s documentation linked above. 4. Export the APN certificate to the server side. As described in Apple’s documentation, you can choose to export the certificate to .pem format. This certificate can then be used on the server side of your app infrastructure to connect to the APN and send push notifications to targeted devices. Notice that the delegate is passed the deviceToken. This token is NOT the same as the UDID which is an identifier specific to the hardware.The deviceToken is specific to the instance of the iOS installation, i.e. it will migrate to a new device if the user were to restore a backup in iTunes onto a new device. The interesting thing to note here is that the deviceToken is static across apps on the specific iOS instance, i.e. the same deviceToken will be returned to other apps that register to send push notifications. The sendProviderDeviceToken: method sends the deviceToken to the provider (i.e. your server side implementation) so the provider can use it to tell the APN which device to send the targeted push notification to. In the case where your application is not running and the iOS device receives a remote push notification from the APN destined for your app, the didFinishLaunchingWithOptions: delegate is invoked and the message payload is passed. In this case, you would handle and process the notification in this method. If your app is already in the running, then the didReceiveRemoteNotification: method is called (you can check the applicationState property to figure out if the application is active or in the background and handle the event accordingly). 6. Implement provider communication with the APN. With the provider keys obtained in step 4, you can implement server side code to send a push notification to your users. As illustrated in Figure 3, you will need the deviceToken of the specific user you want to send the notification to (this is the token you would have captured from the device invoking your implementation of the sendProviderDeviceToken method described in Step 4). The Identifier is an arbitrary value that identifies the notification (you can use this to correlate an error-response. Please see Apple’s documentation for details). The actual payload is in JSON format. Now that we have established details on implementing push-notifications into custom apps, lets discuss applicable security best practices along with abuse cases. 1. Do not send company confidential data or intellectual property in the message payload. Even though end points in the APN architecture are TLS encrypted, Apple is able to see your data in clear-text. There may be legal ramifications of disclosing certain types of information to third-parties such as Apple. And I bet Apple would appreciate it too (they wouldn’t want the liability). 2. Push delivery is not guaranteed so don’t depend on it for critical notifications. Apple clearly states that the APN service is best-effort delivery. As shown in Figure 4, the push architecture should not be relied upon for critical notifications. In addition, iPhones that are not connected to cellular data (or when the phone has low to no signal) MAY not receive push notifications when the display is off for a specific period since wifi is often automatically turned off to preserve battery. 3. Do not allow the push notification handler to modify user data. The application should not delete data as a result of the application launching in response to a new notification. An example of why this is important is the situation where a push notification arrives while the device is locked: the application is immediately invoked to handle the pushed payload as soon as the user unlocks the device. In this case, the user of your app may not have intended to perform any transaction that results in the modification of his or her data. 4. Validate outgoing connections to the APN. The root Certificate Authority for Apple’s certificate is Entrust. Make sure you have Entrust’s root CA certificate so you are able to verify your outgoing connections (i.e. from your server side architecture) are to the legitimate APN servers and not a rogue entity. 5. Be careful with unmanaged code. Be careful with memory management and perform strict bounds checking if you are constructing the provider payload outbound to the APN using memory handling API in unmanaged programming languages (example: memcpy). 6. Do not store your SSL certificate and list of deviceTokens in your web-root. I have come across instances where organizations have inadvertently exposed their Apple signed APN certificate, associated private key, and deviceTokens in their web-root. The illustration in Figure 5 is a real screen-shot of an iOS application vendor inadvertently exposing their APN certificates as well as a PHP script which lists all deviceTokens of their customers. I would also highly recommend protecting your cert with a passphrase (it is assumed to be null in the above example). And it goes without saying that you should also keep any sample server side code that has the passphrase embedded in it out of your web-root. In fact, there is no good reason why any of this information should even reside on a host that is accessible from the Internet (incoming) since the provider connections to the APN need to be outbound only. I feel Apple has done a good job of thinking through security controls to apply in the APN architecture. I hope the suggestions in this article help you to think through how to make sure the APN implementation in your app and architecture is secure from potential abuses. And here are two images detailing the issue. Figure: Image on left illustrates the page rendered which displays the ‘fake’ URL bar while the real URL bar is hidden above. Image on right illustrates the real URL bar that is visible once the user scrolls up. Notice that the address bar stays visible while the page renders, but immediately disappears as soon as it is rendered. Perhaps this may give the user some time to notice but it is not a reasonably reliable control (and I don’t think Apple intended it to be). 1. Precious screen real estate on mobile devices. This is most likely the primary reason why the address bar disappears upon page load on the iPhone. Note that on the iPhone, this only happens for websites that follow directives in HTML to advertise themselves as mobile sites (see the source of the index.html in the demo site above for example). 2. The consequences of full screen apps in iOS using UIWebView. Desktop operating systems most often launch the default web browser of choice when a http or https handler is invoked (this is most often the case even though the operating systems provide interface elements that can be used to render web content within the applications). Figure: Twitter App rendering web content on the iPad. In such cases, it is clear that developers of iOS applications need to make sure they clearly display the ultimate domain from which they are rending web content. A welcome addition to this would be default behavior on part of UIWebView to display the current domain context in a designated and consistent location. In this article, I will discuss the security concerns I have regarding of how URL Schemes are registered and invoked in iOS. URL Schemes, as Apple refers to them, are URL Protocol Handlers that can be invoked by the Safari browser. They can also be used by applications to launch other applications to perform certain transactions, but this use case isn’t relevant to the scope of this discussion. Fantastic. A malicious website should not be able to initiate a phone call without the user’s explicit permission. This is the right behavior from a security perspective. Now, let us assume the user has Skype.app installed. Let us also assume that the user has launched Skype in the past and that application has cached the user’s credentials (this is most often the case: users on mobile devices don’t want to repeatedly enter their credentials so this is not an unfair assumption). Now, what do you think happens when a malicious site renders the following HTML? In this case, Safari throws no warning, and yanks the user into Skype which immediately initiates the call. The security implications of this is obvious, including the additional abuse case where a malicious site can make Skype.app call a Skype-id who can then uncloak the victim’s identity (by analyzing the victim’s Skype-id from the incoming call). I contacted Apple’s security team to discuss this behavior, and their stance is that the onus is on the third-party applications (such as Skype in this case) to ask the user for authorization before performing the transaction. I also contacted Skype about this issue, but I have not heard back from them. I do agree with Apple that third-party applications should also take part in ensuring authorization from the user, yet their stance leaves the following concerns unaddressed. Third party applications can only ask for authorization after the user has already been yanked out of Safari. A rogue website, or a website whose client code may have been compromised by a persistent XSS, can yank the user out of the Safari browser. Since applications on iOS run in full-screen mode, this can be an annoying and jarring experience for the user. Unlike the case of the tel: handler which enjoys the special privilege of requesting the user for authorization before yanking the user away from his or her browsing session in Safari, third party applications can only request authorization after they have been fully launched. A solution to this issue is for Apple to allow third party applications an option register their URL schemes with strings for Safari to prompt and authorize prior to launching the external application. Should Apple audit the security implications of registered URL schemes as part of its App Store approval process? Apple’s tel: handler causes Safari to ask the user for authorization before placing phone calls. The most logical explanation for this behavior is that Apple is concerned about their customers’ security and doesn’t want rogue websites from being able to place arbitrary phone calls using the customer’s device. However, since the Skype application allows for such an abuse case to succeed, and given that Apple goes to great lengths to curate applications before allowing them to be listed in the App Store, should Apple begin to audit applications for security implications of exposed URL Schemes? After all, Apple is known to reject applications that pose a security or privacy risk to their users, so why not demand secure handling of transactions invoked by URL Schemes as well? Skype is just one example. Besides Skype, there are many additional third party applications that register URL Schemes that can be invoked remotely by Safari. See the following websites for a comprehensive list http://wiki.akosma.com/IPhone_URL_Schemes and http://handleopenurl.com/scheme. List of registered URL Schemes not available to the user. You can enumerate all the Info.plist files in your iPhone to ascertain the list of URL schemes your iPhone or iPad may respond to assuming you have jailbroken your iPhone. However, it may make sense for this list to be available in the Settings section of iOS so users can look at it to understand what schemes their device responds that can be invoked by arbitrary websites. Perhaps this will mostly appeal to the advanced users yet I feel it will help keep the application designers disciplined the same way the user location notification in iOS does. This will also make it easier for enterprises to figure out what third party applications to provision on their employee devices based on any badly designed URL schemes that may place company data at risk. Note that in order to create a registry of exposed URL schemes, Apple cannot simply parse information from Info.plist because it only contains the initial protocol string. In other words, the skype: handler responds to skype://[phone_or_id]?call and skype://[phone_or_id]?chat but only the skype: protocol is listed Info.plist while the actual parsing of the URL is performed in code. Therefore, in order to implement this proposed registry system, Apple will have to require developers to disclose all patterns within a file such as Info.plist. I feel the risk posed by how URL Schemes are handled in iOS is significant because it allows external sources to launch applications without user interaction and perform registered transactions. Third party developers, including developers who create custom applications for enterprise use, need to realize their URL handlers can be invoked by a user landing upon a malicious website and not assume that the user authorized it. Apple also needs to step up and allow the registration of URL Schemes that can instruct Safari to throw an authorization request prior to yanking the user away into the application. Given the prevalence and ever growing popularity of iOS devices, we have come to depend on Apple’s platform with our personal, financial, and health-care data. As such, we need to make sure both the platforms and the custom applications iOS devices are designed securely. I hope this writeup helped increase awareness of the need to implement URL Schemes securely and what Apple can do to assist in making this happen.